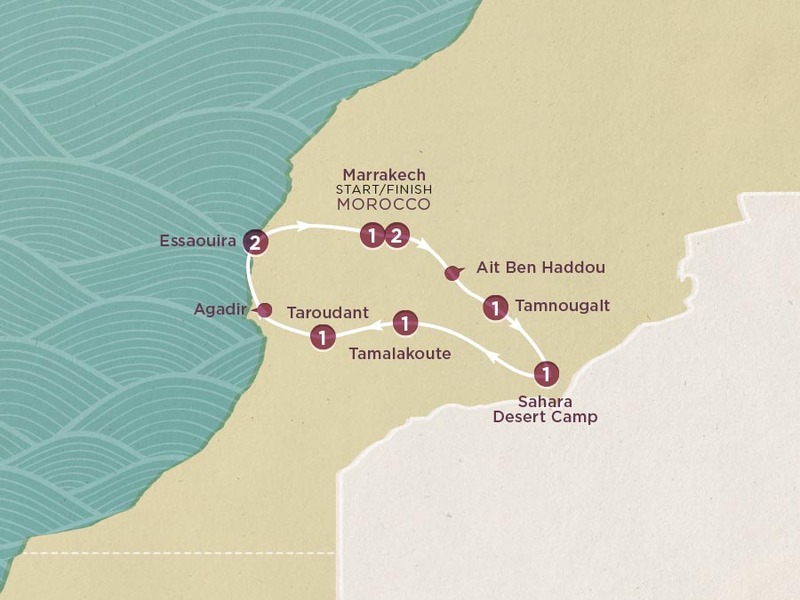 Get your first taste of Morocco’s delicate dance of old and new world in the 18-plus souks that fill the city streets and prepare to bend it like the Berbers. Just make sure you arrive in time for tonight’s welcome meeting. Kick start your day with a guided city tour and see the Saadian tombs and Bahia Palace before ending in Djemaa El-fna – a town square that houses snake charmers, Barbary apes, singers, dancers, drummers and even a dentist. It's like Mardi Gras every day. Prepare for some of the most epic scenery as we cross the Tizi n’Tichka pass. Alpine-esque fields of grazing sheep clash with unforgiving rocky terrain, mud-brick houses and some of the most nerve-shredding hairpin bends – plus a visit to World Heritage listed Ksar in Ait Ben Haddou. Tonight, sleep it off in a Kasbah. Leaving snowcapped mountains to go boarding on a sand dune sounds impossible, but it’s happening. Blast across sand flats, wind between desert dunes and rattle your bones over the dry Draa River to reach our camp on the edge of the Erg Chigaga dunes. Board till sand fills every orifice then feast on tagine around the fire. This is glamping, desert style. Lake Iriki is the bane of desert survival, unless you’re a Berber. Its mirages can fool you into thinking this is the coast and it’s time for a cocktail. Shack up for the night in a small village as a local Berber family welcome you into their home. As far as road trips go, crossing the otherworldly volcanic landscape of the Jebel Siroua Mountains by 4x4 bats well above average. Expect endless twists through rock-strewn desert vistas, climbing to an elevation of 2500m with a window-slideshow of deep valleys, barley and saffron fields. Keep watch for blink-and-you’ll-miss-it villages where the Ait Ouaouzguit Berbers herd donkeys and weave a rug like no other. In the Argan Forest there are goats that live in trees. How awesome is that?! Spend some time staring at them, then we’re off to the beach! Hold onto your hat! This charming fishing town is a mecca for windsurfers thanks to its howling coastal wind. Wander the medina or hit the beach between market shopping. Pro tip: dine at the open-air fish stands for some essence of Essaouira tonight. Wash the last of that desert sand off before we head back to the Red City and take the chance to meander the medina in Marrakech. ‘Our last night in Morocco’ sounds like a cheesy romance novel, but it’s true.